A few days ago I picked up my dog from Cherrydown Basildon Veterinary Hospital where he had been for 4 days following a frightening attack of heatstroke. 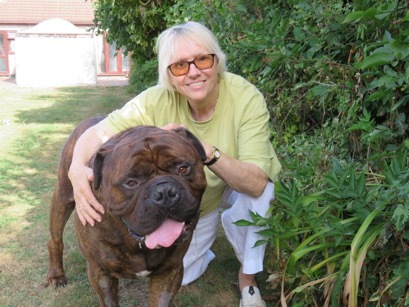 Although I have many years experience with dogs I had not been faced with having to deal with this condition before and, had I not known the basic procedures to follow, I am quite sure my boy, a 70 kg Bullmastiff, wouldn’t be alive today. Even so, without the treatment he received at Cherrydown over the next few days, without doubt he would not have survived. It was an excessively hot day and Mannie, the Bullmastiff in question, appeared to be panting more than usual so I brought him inside so that he could lay on the cool tiles in the kitchen. He was restless and went into the garden and lay in the shade of the bushes where he was violently sick. I ran to help him and he walked towards me, staggered, then collapsed. So, recognising the signs of heatstroke, I immediately drenched him with cool water, lifting his legs so that the water played on his groin and under his front legs. I also fetched bags of frozen vegetables from the freezer and placed them on his head and under his armpits. I was on my own and it was impossible for me to move him even an inch so I brought the phone from the house to ring for assistance. I also took his temperature, which was an alarming 42.2. All this time I had the hose playing on him constantly, concentrating on his groin, under arms and feet. I took his temperature again, which was now 41.5, still dangerously high. Cherrydown tried to find an ambulance service to come out to me but, as there was none available, they sent 2 nurses who eventually, with the help of my husband, who had arrived home at the same time, carried him into their vehicle to transport him to their surgery in Basildon. Once at the surgery, they immediately placed him on a drip and injected him to rehydrate him. Over the next 48 hours it was feared he wouldn’t survive the damage that severe overheating can cause to the internal organs but eventually he was returned home to us and is still recovering now. We shall be eternally grateful to Cherrydown for the 24 hour care they gave to our boy. I hope this information might act as a warning to the dangers of heatstroke in hot weather, as my boy was not in a confined space, he was free in the garden and had access to plenty of water so it can happen at any time. 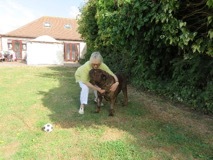 On 24th August we were called to say that Mannie had collapsed after lying in the garden and despite efforts to cool him, his temperature and distress had increased. Due to his size, Cherrydown had to attend to help bring Mannie into the practice. Heat stroke is not confined to dogs being left in hot cars and many dogs, particularly brachycephalic breeds of a dark colour, are susceptible to heat stroke if they lie in the sun for too long on hot humid days and unfortunately, dogs will often preferentially lie in the sun but once develop the increased temperature, are less likely to move themselves to a cooler area. Mannie was immediately placed on fluids and covered ice packs placed in his groin and armpits to cool him. It is important not to submerge them in cold water as this can send them into shock and wet blankets can actually trap a heat layer between the dog and the blanket, and is best avoided as can actually increase their temperature. Mannie was showing signs of aggression, very unlike him, intermittently, due to the swelling of his brain caused by the heat stroke. Some dogs may develop seizures, which can become impossible to control and warrant euthanasia, so he was monitored closely for any signs of deterioration. He was given pain relief, for likely head pain associated with the brain swelling and antibiotics. In dogs with heat stroke, damage can occur to the gut leaving them prone to bacteria leaking from the gut to the abdomen, which can be a potentially fatal complication. He was also started on drugs to reduce inflammation within the bowel. Mannie’s temperature came down in kennels but he vomited blood and developed bloody diarrhoea, typical of a dog with heat stroke. Blood work showed his muscles were starting to break down due to overheating, which can lead to kidney failure. Amazingly, Mannie has recovered fully, was neurologically normal after a few hours and able to walk around unaided 12 hours later and went home within a week. We will still be monitoring him for signs of kidney damage in the immediate future but so far, he has recovered spectacularly, thanks to the rapid intervention by his owner and is back to his usual gentle giant self. We would like to thank Janet for allowing us to use this story to highlight the dangers. Please leave any questions on our facebook page. Previous PostPrevious Why do dogs eat poo?